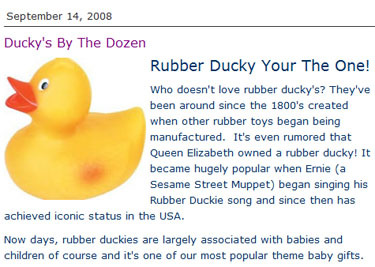 It's even rumored that Queen Elizabeth owned a rubber ducky (which, being in the past tense, implies either Liz or her bath toy are no longer with us)! It (Her Majesty's duck, apparently) became hugely popular ... and since then has achieved iconic status in the USA (which explains why Liz no longer has the duck; it's headlining at Caesar's Palace next month). Now days (who needs extra vowels anywy?) ... it's one of our most popular theme baby gifts (any thoughts on this one? Popular theme-baby? No?). Copyeditor General's ruling: This apparent ignorance of basic grammar makes me so tense. I need a tubby filled with water and nice fluffy suds. This totally made me lawl!